Debenu PDF Split Pro (formerly ARTS PDF Split Pro) is the industry leading solution for splitting large PDF report streams into individual PDF files. For automated processing, documents can be dropped into a watched folder or scheduled via the command line or developer interface. 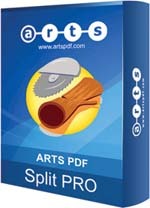 Use Debenu PDF Split Pro to perform intelligent splitting based on page content, bookmarks, file size and page ranges. Debenu PDF Split Pro is built on an engine with the power to process more than 3000 pages per minute* and forms the backbone for enterprise commerce and printing solutions around the world. Split when an invoice ID or other unique identifier on the page changes. Split by specific text — such as page number or chapter heading — appears on a particular page, and use this text to name the resulting split file. Split when a text string appears on two pages in a row, then split the file and make the filename this repeating string. Split when a text string appears on two pages in a row. Split by bookmarks– Most applications offer the ability to break documents by first or second level bookmarks only. With Debenu PDF Split Pro (formerly ARTS PDF Split Pro), you can split documents by any bookmark level and retain bookmarks and links in output files. Split by page ranges– Page ranges and filenames for output files can be defined in tab-delimited text files called ‘control files’. Control files can be created programmatically from within your own application or manually using a text editor or application (such as Microsoft Excel) and configured to run from any of Debenu PDF Split Pro’s interfaces. Split by file size– Specify the size of your PDF fragments and Split Pro will split your PDFs to the closest possible point kilobyte. Split into single files– The original PDF file is split into single pages. Power & performance– Debenu PDF Split Pro is built on a high performance, multi-threaded PDF parsing and splitting engine. With splitting speeds up to over 3000 output files per minute, Debenu PDF Split Pro is aimed at high volume, on-demand workflows. It is designed for monitoring multiple watched folders and deployment on application and web servers and runs unattended. Update navigational elements– Bookmarks, links and named destinations are retained in output files. Large intra-linked PDF documents such as operational manuals and ebooks, can be broken into individual sections while maintaining and updating link actions within table of contents, indexes, bookmark trees and page links. A great way to enhance the usability of large web based documents and improve other business processes. Support for Unicode fonts– Unicode font encodings are now supported for content and bookmark based splitting. Integrate Debenu PDF Split Pro (formerly ARTS PDF Split Pro) with popular reporting and PDF generating systems such as Crystal Reports™. Watched folders– Integrate Debenu PDF Split Pro into your workflow using watched folders. The specified watched folder may be the output folder from your PDF creation application and the can output to another folder watched by a printing, archiving, optimization or emailing system for complete end-to-end automation. The watched folders function can also be used in conjunction with control and co-ordinate files, allowing a fully automated, intelligent server-side splitting solution. Command line– Debenu PDF Split Pro can be executed from the command line and jobs specified via a variety of switches. Splitting can be scheduled via the ‘standard Windows Scheduler’ or from a variety of scheduling applications and programming languages (capable of executing batch files from MS-DOS applications). COM interface– Easily incorporate the splitting power of Debenu PDF Split Pro within your own applications and workflows. The COM object can be used with any scripting language that supports COM, such Visual Basic, Delphi, ASP and PHP. Sample ASP, ASP.NET, Delphi and Visual Basic 6.0 code is included with the installation package. * Testing carried out on Windows 2000 PC with Intel Pentium 4 1.7Ghz processor, 480MB RAM and 30G hard-disk.